Shure’s Microflex Advance Series is designed to dramatically improve the audio quality for modern conferencing applications where pristine speech intelligibility is of utmost importance. Comprising high-quality networked ceiling and table array microphones, audio interfaces, intelligent mixing DSP and intuitive, browser-based control software, Microflex Advance draws on Shure’s extensive experience in microphone, audio networking and automatic mixing technology, and packages it in a discreet, architecturally unobtrusive design. Microflex Advance significantly improves the sound quality experienced by employees in the workplace, making offices and businesses better places to work, and thereby creating a more creative and productive workforce. "We are extremely proud of the engineering and design of Microflex Advance, but this isn't just about selling clever technology," explains Peter James, Managing Director Shure Distribution UK. "Bad sound in the workplace is both frustrating and a hindrance to productivity. Videoconferencing is a great invention, but you can't be understood if you can't be heard properly, and that's an issue for management and employees alike. Make the sound better, and not only will the quality of your conferences improve, your internal communications will be generally better, and your organisation more productive." It is increasingly accepted that noisy workplaces are detrimental to conversation and concentration. When communication is taking place via microphones and loudspeakers, the words spoken are much more susceptible to misunderstanding if the environment at either end is noisy. As refined as modern microphone technology has become, it is essentially passive, cannot distinguish between wanted audio (a person speaking) and unwanted noise (fans, air conditioning, printers etc.) and will reproduce everything indiscriminately, to the detriment of intelligibility. 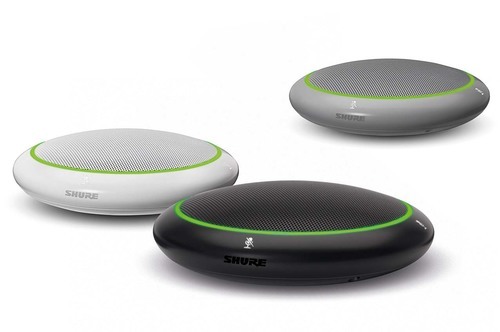 Microflex Advance tackles these issues with innovative new technology, including software control of the array microphones’ pickup patterns to optimise audio capture from speakers and presenters — Shure’s proprietary Steerable Coverage technology. 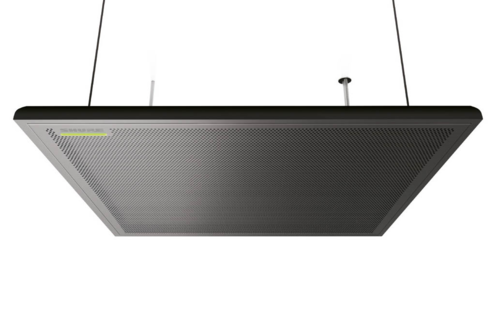 The Microflex Advance ceiling array offers an adjustable pickup pattern with eight lobes that can be defined in three dimensions, and can be flush mounted with ceiling tiles or suspended to avoid fans or ceiling-mount projectors. The table array microphone captures up to four channels of audio from around a desk or conference table and offers an innovative, wholly new 'toroid' (ring-shaped) pickup pattern to reject unwanted sound from overhead, such as ceiling fan or air conditioning noise. Signals from the array microphones are automixed by the built-in Shure proprietary IntelliMix DSP providing seamless activation of the best microphone while attenuating microphones that are not being addressed. Furthermore, the audio signals can be interfaced with a Dante audio network via single standard Ethernet cable connection. Simple-to-use, browser-based software controls connectivity and monitoring. Preset configurations are included for typical operations, and the system is designed to integrate with third-party audio control systems, such as those from Crestron, AMX or QSC. "The perfect conferencing solution is a balance," continues Peter James. "It has to produce high-quality sound, irrespective of how the presenters are using it or bad room acoustics, in addition to being user friendly and integrating perfectly with architectural aesthetics and your network infrastructure. Microflex Advance successfully achieves all of these things. Integrators can have the system on the network and up and running quickly, anyone can operate the system once installed, and the technical innovations we’ve incorporated in the design of the mic arrays and pickup patterns increases productivity and minimizes downtime by ensuring consistent sound quality from any location within your meeting space." "Microflex Advance is unique because it combines the deep roots of expertise Shure has demonstrated in both the acoustic and digital signal processing domains," says Rob Klegon, Associate Manager, Global Product Management at Shure Inc. "However, in building this system we knew we had to go beyond pure technical innovation to meet the needs of today’s corporate environments. As a result, each feature of Microflex Advance is engineered to provide best-in-class performance, from the acoustics and digital signal processing, to the usability and aesthetic design."